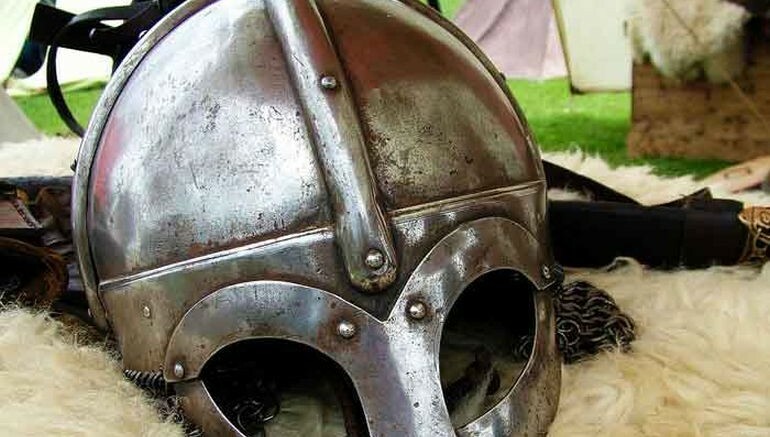 There is more to the fascinating scope of Viking warfare than just shooing away the misconception about their horned-helmets. 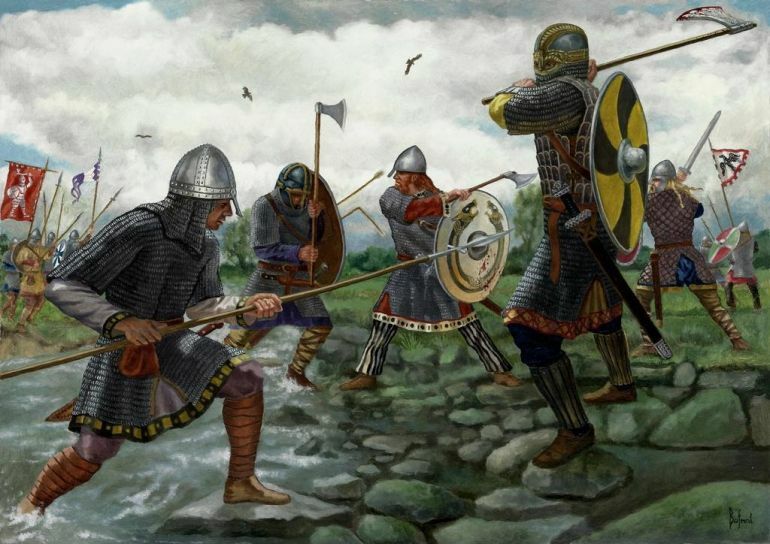 So, without further ado, let us take a gander at ten things one should know about these fearsome Scandinavian raiders and their warfare – a potent historical ambit that dominated the northwestern swathes of Europe for over 200 years. The Scandinavian society had always relied on tribes as their nominal units of warfare. As historian Ian Heath noted, the ‘sub-division’ of such a unit mostly pertained to the extended family or the clan. In essence, the family was considered as the fundamental combat group, and these interwoven clans were known as aett. Suffice it to say, the intrinsic relation between familial ties and combat rather aided in the induction of a warrior culture within the societal fabric of the Vikings. Simply put, the aett trained together, raided together and even fought together in battles. There are also mentions of mass burial grounds that were specifically reserved for the members of the aett who died in combat. As can be gathered from the Viking reliance on tribal structure, the basic framework of such a body was centered around the relation between the leader and his followers (who tended to be free members of an extended family). However, there were also instances of ‘artificial tribes’ that adhered to the notion of the non-blood related loyalty that was expected between a warlord and his band. These artificial clans were mainly forged by landless men who probably belonged in the fringes of the Viking society. And gradually such artificial tribes morphed into warrior-brotherhoods who made their living through banditry and warfare. Also known as Viking-laws (derived from Vikinge-lag), these organizations/clans became critical to the success of overseas Viking warfare, mainly due to the expansionist tendencies of the later Scandinavian warlords. As a result, they were organized as free companies of mercenaries – with their members comprising experienced soldiers who lived under a strict code of conduct. Interestingly, these military brotherhoods never undertook campaigns on their own; instead, they presented themselves during summers and relied on patrons like Viking kings and princes who paid high sums for their services in upcoming conflicts – thus initiating a private military contract of sorts. One of the famed (and often historically disputed) Viking-laws were the Jomsvikingelag or Jomsvikings, who were supposedly founded by none other than Harald Bluetooth. Though not mentioned in contemporary sources, their tales were made renowned by later Danish accounts and the famed Jomsviking Saga. According to many such literary tidbits, their mighty home fortress of Jomsborg was situated near Wollin, by the mouth of the Oder river. As for their might, the members (ranging from 900 to 2,000 warriors) were always chosen from between the ages of 18 to 50, and they had to prove their prowess in a tough fighting duel known as Holmgang. 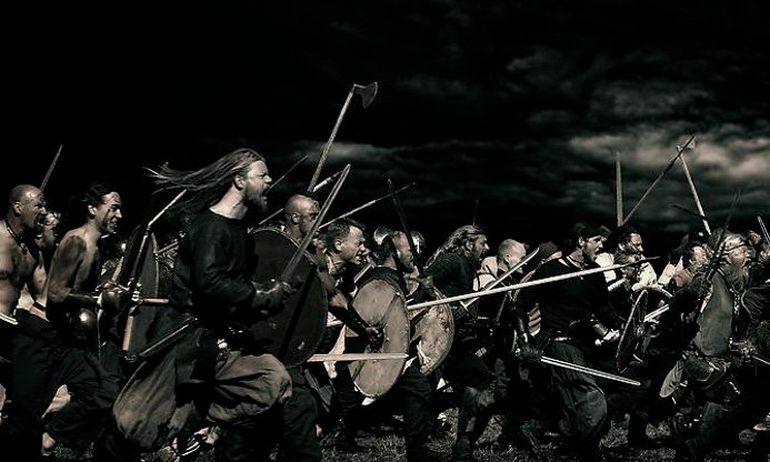 And after induction, the Jomsvikings were expected to show no fear or tendency to flee even when they were hopelessly outnumbered in actual battles. 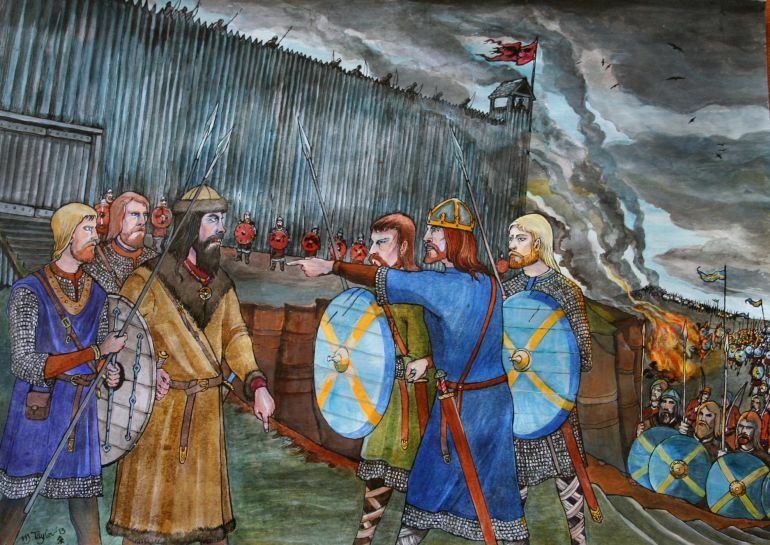 The Viking shield wall (or skjaldborg in Old Norse) was a pretty conventional tactic used by the Norsemen in land battles. It entailed a phalanx-like formation of warriors who were up to five ranks deep. The front line was composed of the most well-armored troops, and their closely-held, upraised shields faced the enemy onslaught. Judging from this simplified description, one would be inclined to think that the Viking shield wall was a purely defensive maneuver. Now while initially, such a tight formation might have depended on the reactive charge of the enemy, there are other dynamic factors to take into account on a battlefield. For example, practical observations have proven that in hand-to-hand combat, an extra room (elbow length) could turn the tide of engagement, as it endows the warrior with space to swing his ax or melee weapon. So in the case of the shield-wall, the seasoned warriors in the front ranks probably overlapped their shields, and this interlocking ‘facade’ absorbed the first impact of the enemy charge. 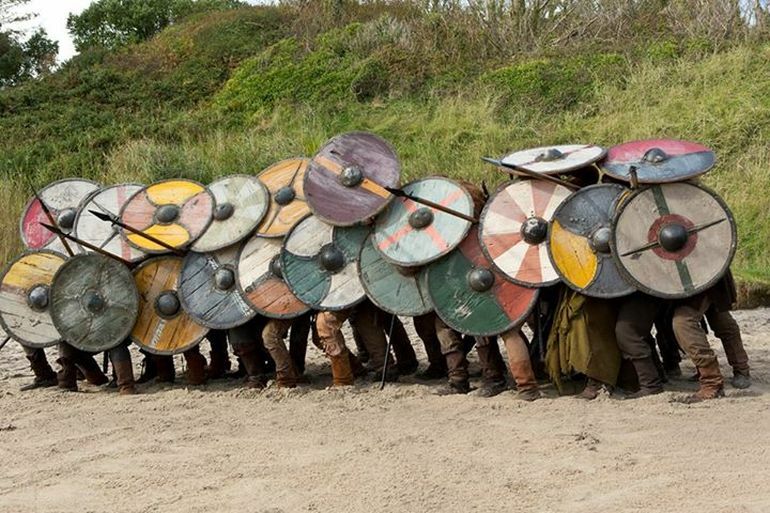 But once the charge ran out of steam, the Vikings generated their own momentum by pushing off the enemy forces with the help of their shields. This in turn automatically loosened their own formation and allowed for the elbow-length room that was needed for a good-ole, lusty swing of their axes. With warfare being ingrained intrinsically in their culture, the Vikings looked forth to new ways to conduct their conflicts. According to historian Ian Heath, one of these military measures of the Viking Age pertained to the ‘hazelled field’. In basic terms, it was a chosen battlefield which was intentionally fenced with hazel branches on all sides. So if one side issues a challenge to their opponents, the enemy forces were bound by their warrior-code to answer the challenge on this prearranged battlefield on a specified date and time. Failure to do so was considered dishonorable, especially before any invasion was to take place. Interestingly, it seems even the English were aware of such a tradition inculcated among the Vikings. And probably on one instance, King Athelstan took advantage of this warrior-norm and issued a challenge to his Viking opponents (whose forces were swelled by Welsh and Scottish allies) at the Battle of Brunanburh, which was supposedly fought in a hazel field in 937 AD. There was a strategic angle to this challenge, with the English king possibly trying to delay the assorted enemy forces from pillaging his territory before their invasion commenced. 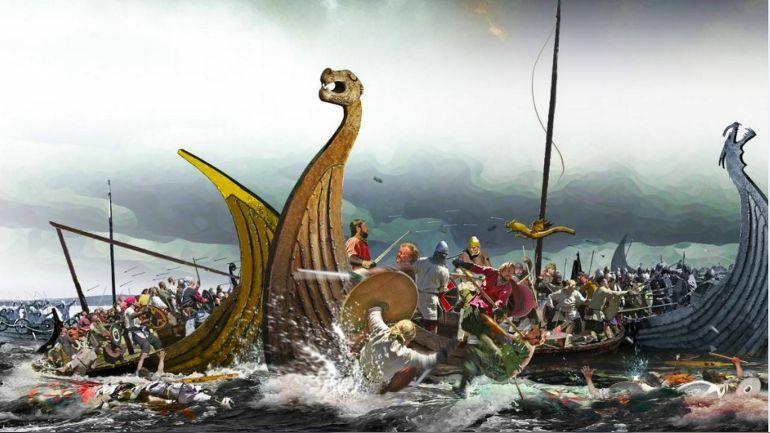 Considering the popular image of Vikings being associated with dragon-headed longships, it might not come as a surprise that marine-based expertise is what the Norsemen excelled at. However quite interestingly, when two opposing fleets met at a naval battle, the Vikings made sure that the encounter played out like a land-based battle. How so? Well, before the start of the battle, the Vikings arranged their fleets in lines, with the largest ships being roped together gunwale to gunwale – thus resulting enormous floating platforms. In such a ‘formation’, the biggest and longest ships, commanded by the king and other warlords, were kept in the middle; and their prows extended beyond other ships. Suffice it to say, these prows (also called bardi in Norse) faced the thick of the battle and were therefore reinforced with armor plates and even iron spikes known as skegg that were designed to puncture holes into enemy ships. These huge floating platforms were obviously supported by smaller vessels on their flanks. They were tactically deployed for additional reinforcements and for pursuing the defeated enemy in flight. Now given the arrangement of the slightly wedge-shaped formation of the platforms, the main battle was conducted with the two naval forces (in their platforms) meeting almost head-on and then trying to grapple and board their enemy ships. Before such a chaotic action commenced, the archers were handy in peppering the enemy with arrows, javelins and even stones. So simply put, the Vikings didn’t employ (at least intentionally) the classic naval tactic of ramming their prows into the enemy ship’s oars-section. Instead, they mainly relied on the ferocity of their crew members for fighting the purely naval engagements – just like land battles. While Viking raiding ships were one of the defining features of Viking raids and military endeavors, these vessels had variance in their designs – which is contrary to our popular notions. According to historians, this scope of variance can be credibly hypothesized from the sheer number of technical terms used in contemporary sources to describe them. To that end, the Vikings before the 10th century made very few distinctions between their varied merchant ships and warships – with both (and other) types being used for overseas military endeavors. 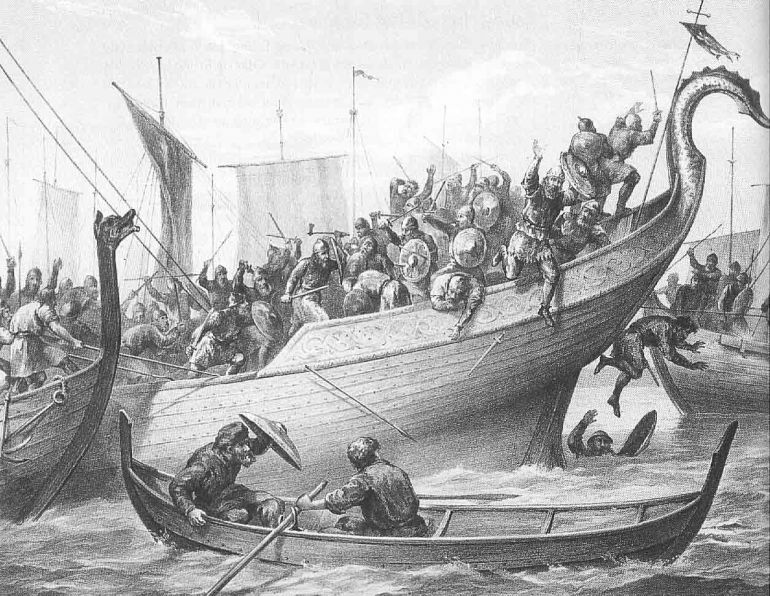 Simply put, the first Viking raids along the English coasts (including the plundering of the Lindisfarne monastery in 793 AD, that marks the beginning of the Viking Age) were probably made with the aid of such ‘hybrid’ ships that were not specifically tailored to military purposes – as opposed to the ‘special’ ships showcased in The Vikings TV series. 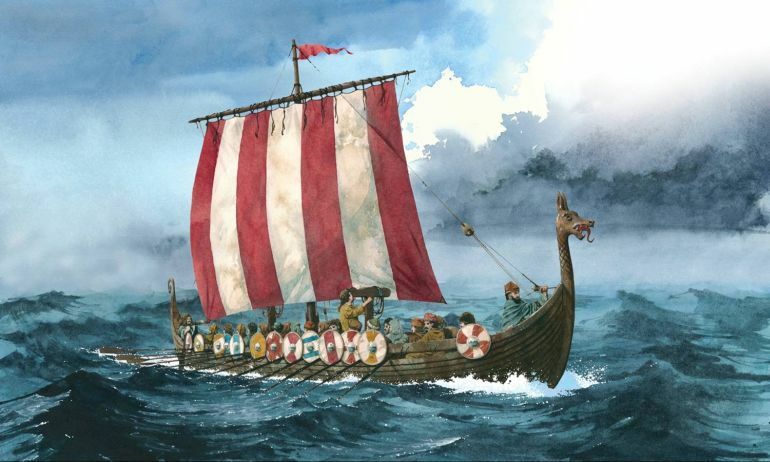 However, in the post 10th century period, the Viking raiders boosting their organized numbers by military establishments or ledungen, did strive to specifically design military warships, with their structural modifications tailored to both power and speed. Known as snekkja (or thin-like), skeid (meaning – ‘that cuts through water’) and drekar (or dragon – derived from the famed dragon-head on the prow); these streamlined longships tended to be longer and slimmer while accounting for a greater number of oars. On the other hand, increased trading also demanded specialized merchant ships or kaupskip that were broader with high freeboards, and depended on their greater sail-power. 7) Few Viking ships could even carry over 300 men! Given their svelte design credentials, the Viking longship traditionally required only a single man per oar when cruising through the neutral waters. But when the battle was at hand, the oarsman was joined by two other soldiers whose job was to not only give a lending hand (for increasing the ship’s speed), but also to protect the oarsman from enemy missiles. And as the Viking raids became more profitable and organized, the wealth was translated to even bigger and better warships. One good example would pertain to King Olaf Tryggvason’s (who ruled Norway from 995 to 1000 AD) aptly named Long Serpent. According to legends, this ship supposedly carried eight men per half-room (or oar) at the naval Battle of Svolder, which would equate to over 550 men overboard if we also count the other combatants. Now in practical terms, this scenario might have been a bit exaggerated with probable translation issues. But even if we account 8 men per room (or 4 men per oar), the total number of men that Long Serpent could carry would have gone beyond 300! As the renowned Anglo-Saxon Chronicle documented, the ‘Great Heathen Army’ (or hæþen here in Old English) of the Vikings descended upon the four Anglo-Saxon kingdoms starting in 865 AD. 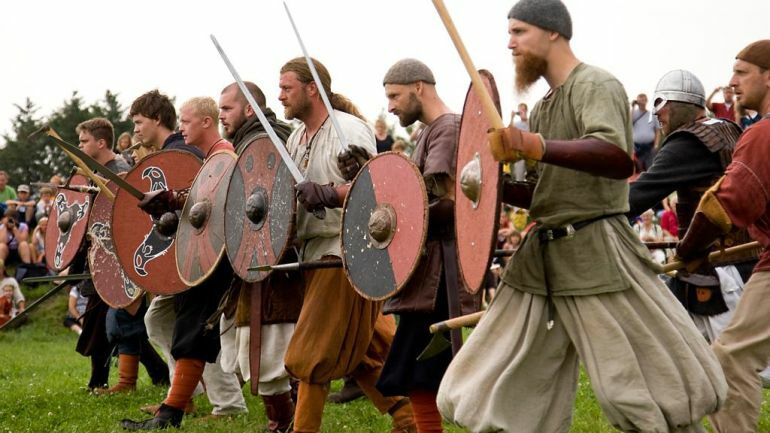 Unlike most Scandinavian raiders, these Vikings entailed a coalition of sorts, with the Norse warriors originating from Sweden, Norway, and Denmark, fighting under a unified banner. According to some legends, they were commanded by the so-called sons of Ragnar Lothbrok (the very same character portrayed in The Vikings TV series). Now while the contemporary source talks about an army of a substantial size, they don’t really delve into the actual numbers of the invading forces. However, some modern historians like Pete Sawyer have taken the etymological route in defining what actually constituted an ‘army’. In that regard, one of the law codes of King Ine of Wessex (issued in 694 AD), defines an here or army as consisting of only 35 men (sourced from The Vikings by Ian Heath)! 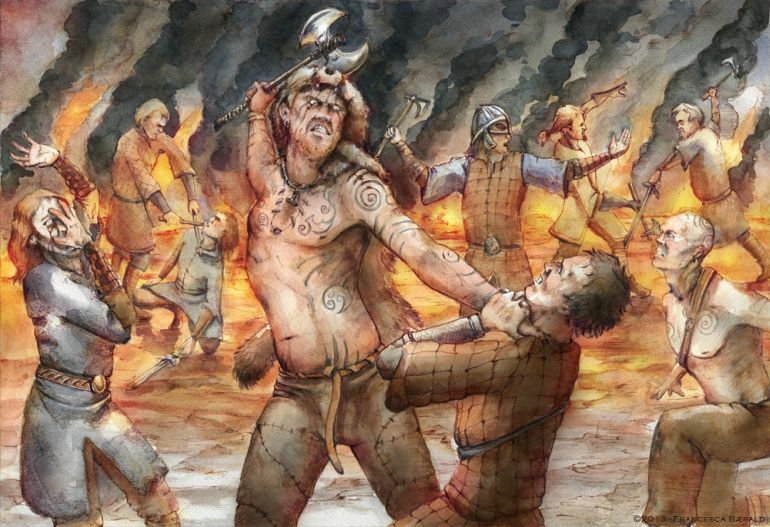 Now historically, as the conflict dragged on – after joined by two other Viking invasion forces in the coming decades, the Heathen Army grew restless with various stalemates in the actual battlefields. Finally, in 896 AD, most of their forces dispersed, with one major group making way for the profitable Seine in ships. According to accounts, this group traveled in only five vessels and thus may have numbered less than 400 men. This once again alludes to the total number of men in the actual invasion force, which may have ranged from just 2,000 to 3,000 men – as opposed to their apparent ‘greatness’ in numbers. A big chunk of the Viking Age coincided with paganism among the Vikings, and during these centuries, the berserkir or berserkers were seen as humans who possessed supernatural powers by the blessing of Odin himself. In that regard, much had been said about their so-called berserk fury which allowed such men to forgo pain and demonstrate fanatical levels of strength, like killing well-armored enemies in just a single stroke. However, in reality, going ‘berserk’ was probably just a form of delusion/paranoia also known as lycanthropy. In medical terms, lycanthropy is defined as the rare psychiatric syndrome that encompasses a delusion that the affected person can transform (or has transformed) into a non-human animal. Literary pieces of evidence do point to such cases of lycanthropy – like in the example of the Volsunga Saga where Sigmund wears wolf skins, howls when aggravated, and even goes on to use the speech of wolves. Other possibilities of going berserk might have entailed hereditary conditions and even epileptic seizures. There may also have been some pretty mundane reasons for taking up the role of a berserker – with some vagabond outlaws preferring the theatrics that would have intimidated the passers-by. Some researchers have also put forth the hypothesis that berserk fury may have been induced by ingestion of materials with psychoactive properties. In any case, berserkers did project an aura of awe and fear even during Viking times – as is evident from their frequent postings as high-level bodyguards of pagan Viking chieftains (as described in Hrafnsmal and Harald Fairhair’s Saga). As Ian Heath suggests, one of the defining features of the invading Vikings other than their renowned longships is associated with their rampant use of banners. These war-flags or gunnefanes had fantastical depictions ranging from winged monsters to serpents. But the most widely recorded of all Viking standards pertains to their bearing of some raven device. Known as Reafan (or Raven), these flags were given a special status within the pagan Scandinavian religion. In fact, according to most contemporary accounts, the Vikings believed that the raven standards had the ‘power’ to impart victory as long as they kept fluttering proudly in the battlefield. 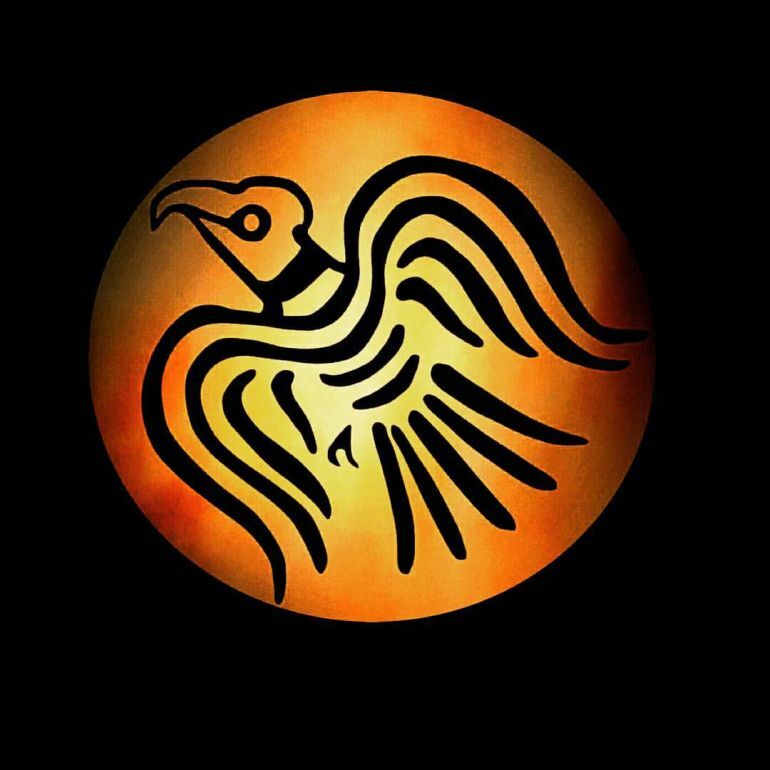 Now from the perspective of religion, this shouldn’t be too surprising, since the raven was considered as the bird of Odin, the All-Father (or Alföðr) associated with the supreme god of war and slaughter in various Germanic traditions. To that end, many Vikings believed the raven standards to be imbued with pure magical energy, and henceforth were the works of sorceresses who supposedly knitted and embroidered such war-flags. And intriguingly enough, the motif of the raven continued long after Christianity arrived in Scandinavia. For example, it was said that Harald Hardrada (a Viking who fought as a Varangian Guard for the Eastern Roman Empire) proudly displayed his famed Landeythan (‘Landwaster’) flag with the raven device. Book References: The Vikings (by Ian Heath) / Viking Hersir (by Mark Harrison) / The Viking Ship (by Per Bruun).